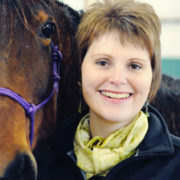 Alissa Gauger is passionate about supporting connection with the self as well as connection with animals and nature. She has developed a deep appreciation for horses by living with and fostering three miniature rescue horses and three full-size horses on her farm. The powerful and constant feedback horses provide is a mirror that can be used to bring about change. As an Equus Coach a Certified Martha Beck Coach, Gauger is excited to offer the same powerful opportunity to others. Through her own journey, Gauger also discovered Tension & Trauma Releasing Exercises (TRE) and is now a Certified Provider. She holds a Bachelor’s degree from the University of Wisconsin-Madison and a Master of Business Administration from Edgewood College. Gauger is a member of the International Coach Federation.